Clothes are a funny thing. As humans, we collectively spend an awful lot of time thinking about the various items we wear on our bodies. Clothes make the man, they say, and there is undeniably some truth to it. In my experience, when it comes to projecting a positive attitude, there’s one sure-fire way to do it: don your sharpest threads. And when it comes to clothes, there may be no greater luxury than having an item handmade, just for you, by a skilled tailor or leatherworker. 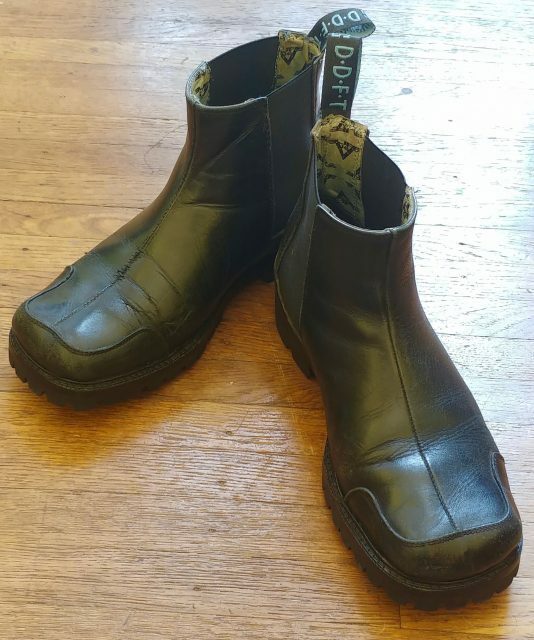 A while back, I wrote about being fitted for new boots at Al’s Attire, the distinctive North Beach boutique operated by San Francisco’s Al Ribaya. Al has been making custom clothing in San Francisco for decades, and his idiosyncratic shop at the corner of Grant Avenue and Vallejo Street has become an integral part of the North Beach landscape. be•spoke bəˈspōk: (of goods, especially clothing) made for a particular customer or user. As I reported at the time, the fitting process was impressively detailed, and gave me a new respect for the precision of the clothier’s art. It’s worth saying again: I’ve had medical examinations that weren’t this comprehensive. However, it was my ability to choose every aspect of the shoe in the design process that really reeled me in. 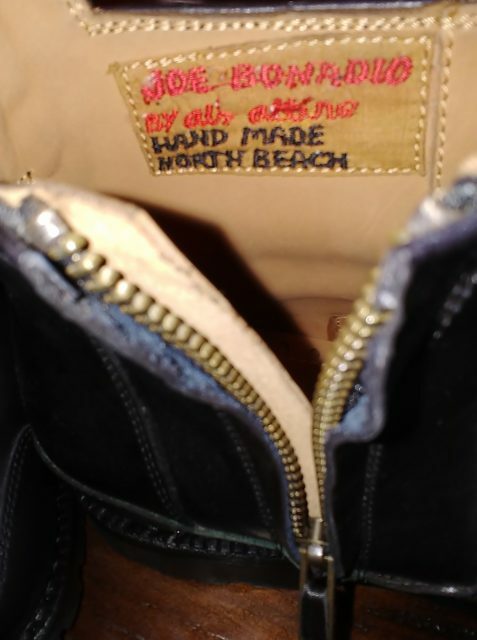 I was able to pick out the style of the shoe, the leather, the sole, the eyelets, the stitching, everything. More elements go into a piece of footwear than you realize–and for your shoe, you get to pick every last one. 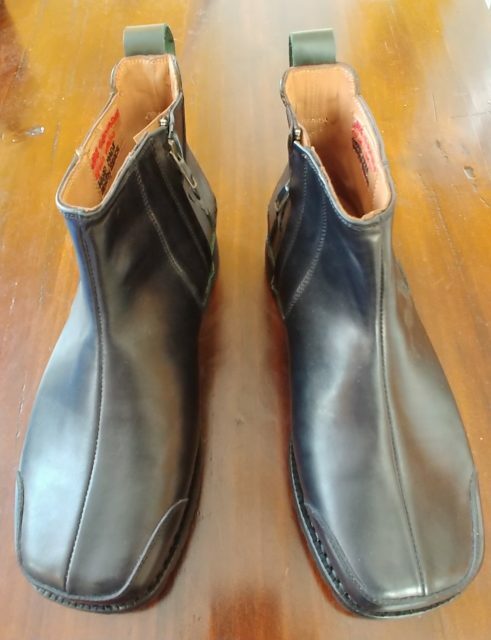 For my first bespoke pair of shoes, I had chosen a recreation of my all-time favorites: the black John Fluevog half-boots that I had been wearing for five years, now all but ash-canned. And I was in for a nice surprise: according to Renée, Al’s intrepid leatherworker, the originals could actually be restored! As dilapidated as those old warhorses were, they would soon ride again. So in effect, I’d now have two versions of my favorite boots. Outstanding. Just last week, I got the call. My shoes had arrived! It was a busy day, but I dropped everything and headed directly to Al’s shop. Al was out of town, but Renée was on hand to deliver the goods. The first impression: Fantastic. I absolutely loved the way the new version turned out. The toe was a little sleeker than the original, just as Al had suggested during the design process, and the finished product was exactly as I had imagined. The touch of Kelly green leather on the heelcap was the perfect accent against the black. And perhaps most importantly, they fit perfectly–as only a handmade shoe can. And it got even better. The ‘reboots’–my favorite pair, that I had proudly worn and soundly abused for over 5 years–were back to prime condition. The leather, which had been hopelessly abraded, had miraculously been babied back to life. And then I put them on. Amazingly, they fit like they never had before. You see, Al’s leatherworkers hadn’t just resoled them, and brought back the leather. Using their carefully recorded dimensions of my feet, they had also refitted the inside of each boot. Now they hugged my feet closely, in a way they hadn’t on the day I had first bought them. I had given those boots up for dead, mind you, so I was (and am) beyond thrilled. Verdict: go get yourself a pair of shoes at Al’s Attire. And if you have a pair that you just can’t bear to let go of, you may just have other options. Talk to the experts at Al’s, and you might be surprised what comes of it. Of course, Al being the restless maker that he is, we’ve already moved on to the next phase: The Suit. Tune in next time, when I’ll be going through a complete fitting and designing my dream suit–with the man himself, Al Ribaya. See you then!